I was able to complete a lot of sewing yesterday. So much so that I finished the double hearts wall hanging center I was working on. Only thing left is to add the borders and quilt and it will be ready to hang. I'm happy with how it turned out and loved how the accuquilt pieces went together so easily! 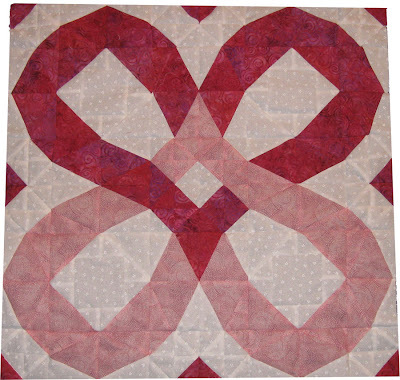 I usually don't name my quilts but this one I'm thinking about calling "Endless Love". Now off to iron, square it up and add some borders.